This spirited volume shows how postwar designers embraced whimsy and eclecticism in their work, exploring playfulness as an essential construct of modernity. Following World War II, Americans began accumulating more and more goods, spurring a transformation in the field of interior decoration. Storage walls became ubiquitous, often serving as a home’s centerpiece. Designers such as Alexander Girard encouraged homeowners to populate their new shelving units with folk art, as well as unconventional and modern objects, to produce innovative and unexpected juxtapositions within modern architectural settings. Playfulness can be seen in the colorful, child-sized furniture by Charles and Ray Eames, who also produced toys. And in the postwar corporate world, the concept of play is manifested in the influential advertising work of Paul Rand. 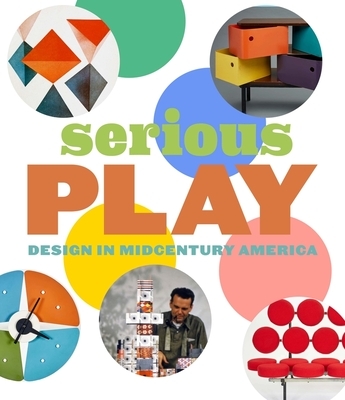 Set against the backdrop of a society that was experiencing rapid change and high anxiety, Serious Play takes a revelatory look at how many of the country’s leading designers connected with their audience through wit and imagination. Monica Obniski is Demmer Curator of Twentieth and Twenty-First Century Design at the Milwaukee Art Museum. Darrin Alfred is curator of architecture, design, and graphics at the Denver Art Museum.